To perform the following tests, disassemble weapon only as far as allowed in chapter 2 (Unit Maintenance Instructions), unless a deficiency is uncovered. 2. Perform a general inspection of rifle per chapter 3 (Direct Support Maintenance Instructions) section V. Repair as required and authorized. 3-22. M16 AND M16A1 RIFLE ANNUAL INSPECTION AND GAGE REQUIREMENTS (CONT). 1. Gage bolt assembly for firing pin protrusion using firing pin protrusion gage PN 7799735. See page 3-13, TEST. 2. Gage bolt assembly for firing pin hole wear using not-go plug gage PN 12620101. See page 3-13, TEST. 3. Inspect chamber in upper receiver and barrel assembly using chamber reflector tool PN 8448201. See page 3-26, inspection/CLEANING. 4. Gage barrel in upper receiver and barrel assembly using barrel erosion gage PN 7799792 or PN 8448496 as applicable. Use muzzle erosion gage PN 8448677 on nonchromed barrels only. Use bore straightness gage PN 8448202 on all barrels. See pages 3-35 through 3-39, TEST. 5. Check headspace in upper receiver and barrel assembly by inserting headspace gage PN 7799734 in chamber. See page 3-38, TEST. 6. 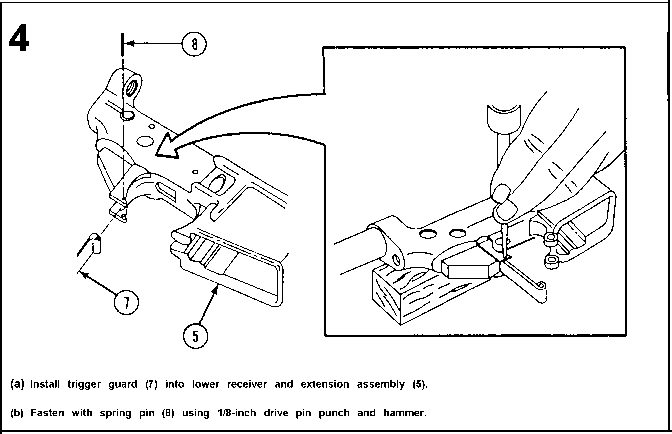 Gage hammer and trigger pin holes in lower receiver assembly using not-go plug gage PN 12006472. See page 3-56, TEST. 7. Gage trigger pull using trigger pull measuring fixture PN 7274758. See page 3-69, TEST. 8. Document inspection with DA Form 2407 and DD Form 314 when completed. Air Force users refer to AFTO Form 105. Section VI. PREEMBARKATION INSPECTION OF MATERIEL IN UNITS ALERTED FOR OVERSEAS MOVEMENT 3-23. GENERAL. Refer to TB 9-1000-247-34.